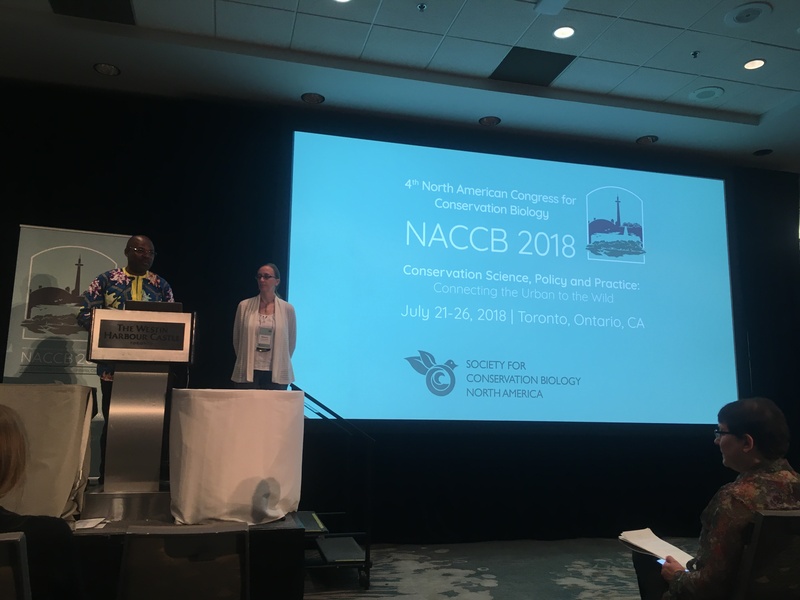 In this post, Verena Sesin reports on her visit at the North American Congress for Conservation Biology (NACCB) in Toronto from July 21-26, 2018, themed “Connecting biodiversity from urban to wild areas by connecting practitioners, managers and researchers”. NACCB events bring together professionals and students concerned with the science and practice of conserving biological diversity, and provide a platform for discussion, innovation and opportunities in science. Attendees come from every sector of the field including the biological and social sciences, management, policy and planning – and some from ecotoxicology! Toronto was an interesting choice of location for this year’s congress. The metropolis has a large and increasing human population yet contains numerous urban parks with both important terrestrial and aquatic habitats – a perfect place to seek to understand the impacts cities have on the nature within and around them. The congress itself hosted numerous symposia, concurrent sessions, workshops, short courses and field trips. I was happy to present some of my recent research results within the session “Human Impacts & Disturbance Ecology”, themed “Protected wetland species are chronically exposed to rapidly shifting pesticide loads in water and sediment originating from nearby agriculture”. I chose the challenge of a speed talk, allowing only 4 minutes to convey my message. While it felt impossible at first to fit introduction, methods, results and conclusions into this short time frame, it was actually perfect to identify my most important findings and create a short story for my audience. I enjoyed the whole speed session compiled of rounds of five speed talks followed by a question period, as the audience stays engaged during the talks and gets the chance to find out more about particular details in the question period. I had good conversations following this speed talk, and was able to network with other researchers interested in the same topics. One highlight at NACCB 2018 was the Conservation Careers Panel, a panel discussion with small-group breakouts to talk about conservation career alternatives to positions at research universities. I was lucky to meet a scientist working in pesticide risk assessment at the US Environmental Protection Agency (US EPA) and we had a great chat about career opportunities but also her experiences with the pesticide registration process. I was able to ask some questions I always wanted to ask an US EPA “insider” about actual study selection criteria, applied scientific methods for risk assessment, and timelines. All in all, NACCB was a great experience and short trip to Toronto – a vibrant city with one of the best after work restaurants and bars. Even though ecotoxicology is not a main focus of the conference, I recommend attending such conferences to broaden your horizon and get input from scientists working on different topics but toward the same goal of protecting the environment. Many thanks to my supervisors and collaborators for their support! This entry was posted in Workshop/Meeting/Summer School and tagged aquatic ecosystems, biology, Conference, conservation, ecotoxicology, pesticides on August 24, 2018 by Ve.